Eric Kipp kicked off his career in New York City working for fashion brand Adam by Adam Lippes before moving to Chicago to create his own luxury menswear label Eric Kipp Custom Clothiers. He takes us on a journey to his favorite travel destination–Vienna. Learn about the architecture, where you must visit while there and the place that will give you the most authentic royal Austrian experience! My grandmother was a seamstress and sample maker, so I was exposed to the art and craftsmanship of making clothes at an early age. Many years later, when I graduated from the Fashion Institute of Technology in New York, I worked for Adam + Eve (now Adam by Adam Lippes) and had the privilege of seeing a new label grow to become an international lifestyle brand. My expertise in tailored menswear was honed during my time with Paul Stuart, where I was hired to develop a new line geared towards younger clients and later tasked with managing the custom clothing business in New York and Chicago. As I spent my entire professional career in fashion, starting my own line was a natural evolution. I now run a Eric Kipp Custom Clothiers, a custom menswear business that caters to the business and social elite, and am working on a wholesale line. I was raised in northern New Jersey. I credit growing up in close proximity to New York City with giving me a global outlook and a tremendous appreciation of other cultures. Where do you live (city+neighborhood)? I live in downtown Chicago, in an area called Streeterville. As I write this, I can see Lake Michigan completely frozen outside my window. It was actually this view of the lake that solidified my move to Chicago eight years ago. I think this is a great city, with a very rich history, and enjoy calling it home. Are you a solo traveler or love company? I tend to travel extensively with my wife and I would not have it any other way. A few months after we met, we took a long trip to Europe together and have been great travel partners ever since. We have very similar tastes and interests and complement each other well. She likes to dive into the culture of a certain area—learn its history, see the sights, experience the cuisine. I find ways for us to experience the creative scene, see what local artists are making. She is very organized and plans detailed itineraries; I make sure we find the time to relax and spontaneously stroll through a city. Together, we have been fortunate to visit over 20 countries and hope to take another trip later this year. I will say, however, that while I prefer company on my travels, I do recommend going somewhere completely on your own. You learn a lot about yourself and it is an opportunity to grow as a person. I once did 10 days solo in Istanbul and the memories will stay with me forever. Tell me about your favorite destination? 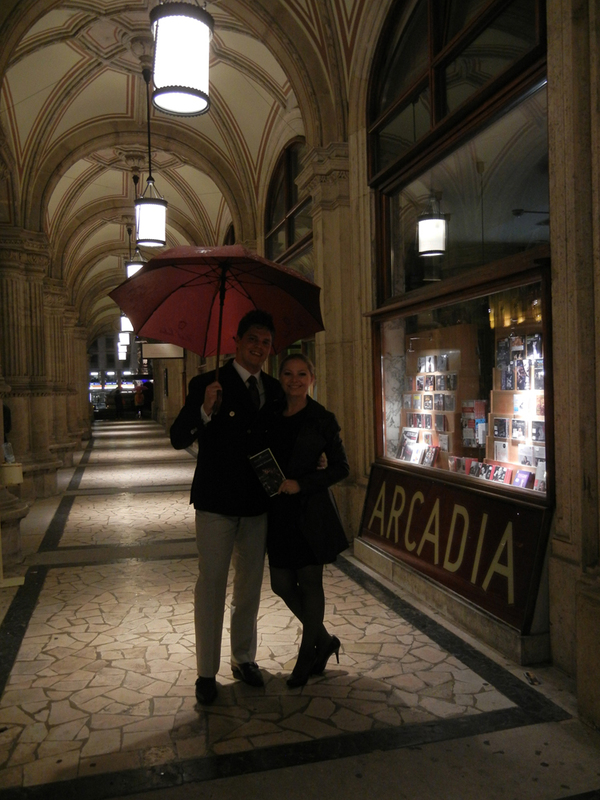 My favorite destination is, without a doubt, Vienna. I visited there with my wife and I toured the former Prussian Empire. The city is beautiful in terms of architecture, culture and cuisine. The people are friendly, quick-witted and very proper. The vast majority in the city can speak English, although a few choice words in German can go a very long way. What are your favorite places at this destination? My favorite place in this destination has to be the Hotel Sacher—the most authentic royal Austrian experience you can get! Even more specifically, the smoking parlor at the Sacher while enjoying a cigar and a glass of port while looking at the vast display of who’s who in the hotel’s famous and royal guests department. We had the pleasure of staying here on a recent trip and feel this is the best hotel we have stayed anywhere in the world. Being next door to the Vienna opera house, we also had a unique opportunity to see the dancers rehearse. Tell me about 6 places or landmarks that I must see when I visit. If you are staying at the Sacher, it is conveniently located right across the street. I never thought I would be an opera person; my first experience was here and it was incredible. It was a royal hunting park when plans were made to build a sumptuous palace to rival Versailles. The interior celebrates the Habsburgs and the gardens surrounding the entire building are a maze of beauty worth exploring. My wife and I have done a tour of palaces across Europe and I truly enjoyed this stop. This is the oldest and one of the largest zoos in the world. My wife visited there when she was a little girl and we wanted to see it together. While it was raining during our visit, we enjoyed walking the extensive grounds and seeing the pandas. A shop that specializes in gold and silver hunting jewelry. They have created items for the Austrian emperor and various notable historic figures and still make everything by hand on premise. The ultimate pipe shop and smoking accessories. If you strike up a conversation with the owner, you will certainly be informed as to what things you must see while in Vienna. While in Vienna, take advantage of the relatively close proximity to a number of amazing stops: the city of Salzburg and the delicious Bavarian cuisine at the Goldener Hirsch; a side trip to Korlovy Vary in the Czech Republic, complete with a stay at the Grand Hotel Pupp (the hotel from James Bond’s Casino Royale), Tai massages and an unforgettable dinner at the Embassy Hotel Restaurant; a river cruise in Budapest and a visit to the international wine festival if you time your trip well; and, of course, Prague. Are you a heavy or light packer? What can’t you leave home without? I am a heavy packer. As a fashion designer, I make sure my garment selections are appropriate for my travels. When abroad, I try to dress as the locals do out of respect for their customs. I can’t leave home without: my cork molsekin to capture ideas, sketch, and keep track of important addresses; my iphone and an international data plan to help navigate unfamiliar areas; a good book, as I can’t go without one on an international flight. Finally, a few universal power adapters—it’s the first thing I pack! Next articleWhat’s the Best Way to Explore Archaeological Sites in Mexico City?